Suffragist Dora Lewis of Philadelphia (center) leaves jail, where she participated in hunger strike to protest her arrest, August 1918. Flip to Alice Paul toasting Tennessee's ratification of the 19th Amendment to the U.S. Constitution, giving women the right to vote. Washington, D.C., August 17, 1920. Pennsylvania suffragists came from a broad range of backgrounds. A founder of the National Women's Party, for which she chaired important committees, Mrs. Lawrence (Dora) Lewis was part of a prominent Philadelphia family. 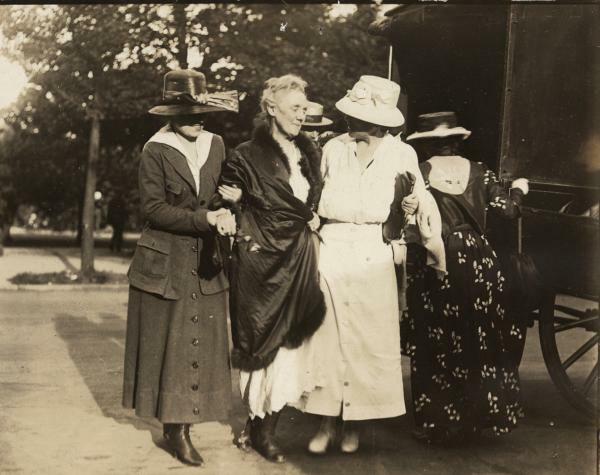 Jailed for participating in a pro-suffrage meeting in Washington D.C.'s Lafayette Square, she participated in a five-day hunger strike that attracted nation attention.